As a member of the TOS Review Crew I had the opportunity hhttp://www.blogger.com/img/blank.gifttp://www.blogger.com/img/blank.gifto review Artistic Pursuits Art Curriculum. We used Book 1 for Grades 4-6 - The Elements of Art and Composition. It is available for $42.95 here. There are also lots of sample pictures from the book on this page so you can get a general idea of what a lesson looks like. I appreciated the supplies needed list in the front of the text. Not only was it clear about when certain supplies were needed - by unit - it also had pictures of the needed supplies. This helped me get the proper item. I also appreciated the What Parents Want to Know section. This section explained the aim of the curriculum, how each Unit was structured and suggestions for scheduling. Their suggestion is two classes per week - 1 hour each - to complete the book in one year. 1. Learn to observe the world around you - to really see it. 3. Learn to focus on one element of art at a time, while drawing, and block out others. Explore Your World - This uses real world experiences to help the student learn to 'see' the world from an art perspective. Make a Drawing - The student tries to make their own drawing based on the objective of the lesson. Something to Try - This encourages the student to try different techniques while drawing. Final Project - Self explanatory. These are accompanied by illustrations that really work well for my non artistic visual learners. My boys do not like to draw and this is not a reflection on this book. They did however - enjoy learning about how to 'see' art and the history behind some of the artists and paintings featured in the book. We learned much about an artist making good use of the space on their paper, line and shape and how they are used to enhance detail in art, texture, shading, shadow, contrast and so many terms they were not familiar with that the text did a great job of showing and telling. For the first time the boys want to go on a field trip to the local art museum to put into practice what we've learned through this book. They are such perfectionists that I did eventually give up on the actual drawing part of the lessons but I tried a few of them myself and the directions are clear and easy to follow. In the back of the book is a helpful 'Evaluation Sheet' to assist in grading the lessons in this book. From the perspective of a non artistic parent this helped me a lot. 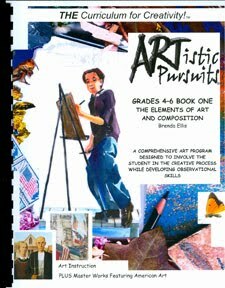 I highly recommend this curriculum for anyone looking to introduce art in their homeschool.